An ongoing investigation into the death of two Bexar County Sheriff’s Department canines has left San Antonio with many questions. How did could this have happened? What could have been done to prevent the tragedy? And will criminal charges be brought? On Tuesday, July 24th, Sheriff’s Deputy Steve Benoy took the dogs in a county-owned Chevrolet Tahoe with dog kennels to his home in Adkins, TX. This routine is standard for officers who work with K-9s and Benoy had done this several times before. On this particular day, though, Benoy did not follow his regular routine and left the dogs locked in the SUV with the windows rolled up at about 2 PM. It is still unclear why. He then left town for an overnight trip. When he returned on Wednesday, almost 30 hours later, the two Belgian Malinois police dogs were dead. It is believed that they died of heat exhaustion, but animal care services will be conducting a necropsy to determine the official cause of death. Benoy has 23 years of service, 13 of which have been as a K-9 handler. He has been placed on leave for 10 days while an investigation into animal cruelty and administration purposes is conducted. 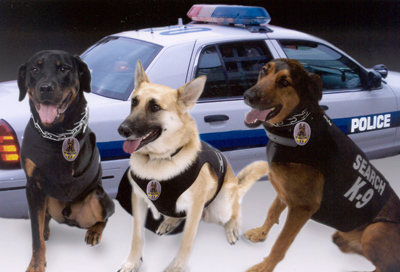 It is estimated that the total cost of a police canine is around $40,000. This includes the initial cost, the training, and the care of the animal. The interior of a parked car can reach scorching temperatures within minutes, especially during the summer. According to PETA’s website, temperatures inside a car can reach upwards of 160 degrees on a 78 degree day. Cracking the windows has minimal to no effect on reducing the temperature. On the Tuesday and Wednesday in question, temperatures in San Antonio were 96 degrees.